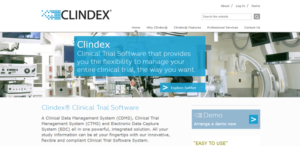 Clindex is a clinical trial software that combines Clinical Data Management System (CDMS), Clinical Trial Management System (CTMS) and Electronic Data Capture System (EDC) into a single, very powerful solution. It puts all the user’s research information right where they can access, utilize, and maximize it, allowing them to remain innovative, versatile, and compliant. With Clindex, users have a fully integrated, robust, and scalable platform that is designed to address all the unique and complex requirements of their studies. Offered as a web-based software or an on-premise hosted solution, Clindex delivers that high degree of flexibility that enables users to quickly adapt the software to their processes and workflows, speed up their clinical trials, and ensure data integrity. Clindex delivers a powerful, robust, and integrated clinical trial management solution that helps you manage all aspects of your study, gather and organize research data, and simplify your other processes while ensuring data integrity and compliance. One of its most obvious benefits is its massive customization versatility. You have a platform that you can tailor, enabling you to create a clinical trial management application that meets and addresses all your basic, specific, and complicated requirements effortlessly and then adapt as your needs change. From visual interfaces, data entry screens, reports, task lists, and screen layouts, Clindex lets you customize all these to streamline your processes, simplify your navigation, and accelerate your study. Integrated data is essential to any research or trial endeavor, With Clindex, all data is centralized in a secure yet easy to access location. The software makes it easy for you and your team to monitor and store common work documents. With all data stored in a single location plus version control functionality, Clindex eliminates the usual problems that come with data – multiple data versions, slow access to information, and lag time. Whenever you need data, Clindex gives it to you in the format that you want. The system supports over 200 reporting formats and offers advanced reporting capabilities such as nested reports, grouping, images and complex layouts. If you are considering Clindex it could also be sensible to investigate other subcategories of Best Clinical Trial Management Software collected in our database of SaaS software reviews. Since each organization has specific business requirements, it is advisable for them to abstain from seeking a one-size-fits-all perfect software application. Needless to say, it would be useless to try to find such a platform even among widely used software applications. The intelligent thing to do would be to list the various vital factors that require consideration such as required features, budget, skill levels of workers, company size etc. Then, you should do your groundwork thoroughly. Read some Clindex reviews and look into each of the other solutions in your shortlist in detail. Such comprehensive research can make certain you discard ill-fitting platforms and zero in on the system that offers all the features you need for business success. How Much Does Clindex Cost? Contact Clindex for information about their basic and enterprise pricing offerings. You can also submit a request for a demo to see if the software is a perfect fit for your business. We realize that when you make a decision to buy Clinical Trial Management Software it’s important not only to see how experts evaluate it in their reviews, but also to find out if the real people and companies that buy it are actually satisfied with the product. That’s why we’ve created our behavior-based Customer Satisfaction Algorithm™ that gathers customer reviews, comments and Clindex reviews across a wide range of social media sites. The data is then presented in an easy to digest form showing how many people had positive and negative experience with Clindex. With that information at hand you should be equipped to make an informed buying decision that you won’t regret. What are Clindex pricing details? What integrations are available for Clindex? If you need more information about Clindex or you simply have a question let us know what you need and we’ll forward your request directly to the vendor.